The scheme has existed in a number of forms over the past seven years (formerly STARS scheme), and is adapted and improved on a yearly basis using input from participants. 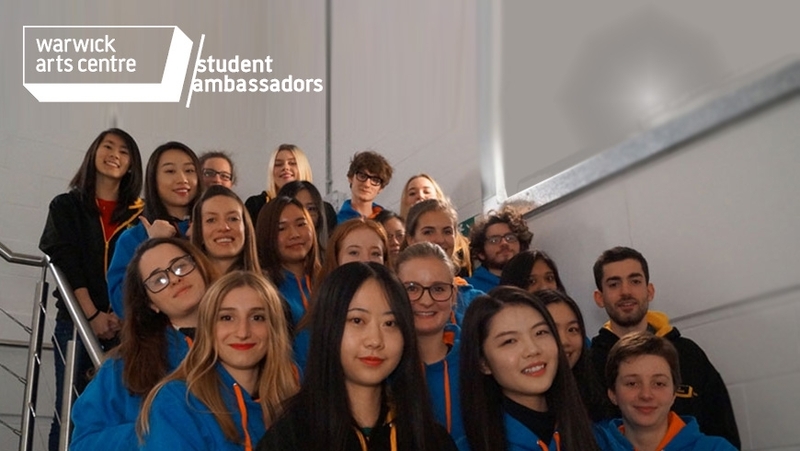 A Student Ambassador is a University of Warwick student, from any academic department and year of study, who has an interest in the creative industries, arts marketing or events promotion. Ambassadors are the student face of the organisation and are very much part of the wider Arts Centre delivery team. Help promote Warwick Arts Centre’s artistic programme by designing and implementing a marketing campaign for a piece of theatre, music, visual arts, or cinema. Write a review, record audio interviews (vox pop), use social media. These strategic development sessions, facilitated by Warwick Arts Centre’s Audience Development Officer, will cover a range of topics and themes, including developing marketing messages, identifying new marketing channels, and exploring ways to work with Societies. Every year Warwick Arts Centre runs a student research project. Ambassadors will have the opportunity to help produce and disseminate a survey, conduct face-to-face interviews, and analyse and report on findings. Support will be provided. Want to work in the arts? Members of the Warwick Arts Centre Team will talk about their role and responsibility within the organisation and their careers. Speakers will include members of the Programming, Marketing, Front of House and Technical teams. Practical workshops with tops tips and expert advice on a range of topics and themes, including marketing planning, audience development, programming, working in a Box Office, etc. Warwick Arts Centre’s Audience Development Officer runs weekly Support Surgeries to help Ambassadors with their Marketing Campaigns, provide advice and best practice for students designing projects etc. You can also keep in touch and get support via Facebook. To get an idea of what the Student Ambassadors get up to, read what past students have said about the scheme. The scheme is strictly limited to 12 volunteers, who are recruited for every academic year shortly after the first week of term. Students hoping to take part in the scheme must complete a short online application form by Wed 10 Oct 2018. Successful candidates will be notified by Fri 12 Oct and invited to a welcome session on Thu 18 or Fri 19 Oct. The scheme is managed by Warwick Arts Centre’s Audience Development Officer with the support of the Marketing Assistant, and led by the Student Ambassador Coordinator, who is a current student at the University of Warwick, usually recruited at the end of the previous year’s scheme. We anticipate that you will be required to dedicate at least 23 hours to the Ambassador Programme over the academic year. Q1. How much time do I need to dedicate to the scheme? We ask that you volunteer at least 23 hours over the academic year. Q2. Is there the opportunity for paid work? On occasion, there are opportunities for paid work – but these are ad hoc. The Student Ambassador Coordinator will introduce these to you when they become available. Q3. Can I get free tickets to see performances and films? We allocate complimentary (comps) tickets to Ambassadors working on marketing and engagement campaigns. Tickets, however, are subject to availability and we reserve the right not to offer tickets. We also provide free cinema tickets for our social events. We can also provide comps to Ambassadors who review select shows. Q4. Can I get a reference at the end of the year? Yes, if you take part in the scheme you can cite us in a job application as a reference. We will have a log of your activity over the academic year – so can base your reference on your levels of engagement in the scheme. Q5. How do I sign up for Student Ambassador Campaigns? The Student Ambassador Coordinator will introduce the performances, concerts and film screenings in the programme that require campaign activity at the start of the academic term. If an event that you want to work on isn’t featured – please mention it to the Coordinator and they will check with the Marketing Team to see if that is possible. Q6. I’m only interested in elements of the programme. Do I have to work across all areas of the scheme? We prefer that all Ambassadors experience all elements of the Ambassador programme, so the scheme might not be for you if you are just interested in just part of it. Q7. I’m struggling to find the time to work on Ambassador activities. What should I do? Speak to the Student Ambassador Coordinator and explain your situation. We can then explore how we can work with you going forward, or if you prefer, you can leave the scheme.